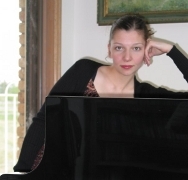 Sofia Mycyk is currently completing her Masters degree in Piano performance at the Université de Montréal under the tutelage of the renowned pedagogue Prof. Marc Durand. Previous teachers included Patricia Zander at the New England Conservatory in Boston as well as Bonnie Nicholson, Kathleen Solose and Nadia March in Saskatoon. She received her Royal Conservatory of Music Performer’s ARCT Diploma in 2004 with First Class Honors with Distinction. Sofia has been a multiple performance award winner at local and provincial music festivals, including top pianist at the Saskatchewan Music Festival and the Canimex Award at the Canadian Music Competition National Finals. Sofia has performed in France at Aix-en-Provence and Vaison-la Romaine, the Bowdoin International Music festival, the Orford Summer Music Academy, the International Piano Master Classes in Banff, the Agassiz Chamber Music Festival and multiple times in Montreal and Saskatoon. She has participated in masterclasses with Boris Slutsky, Jean Saulnier, Marc Durand, Julian Martin and Arie Vardi.